When blue skies beckon people to go outside and enjoy activities and backyard parties throughout the summer, you will see shade popping up at outdoor restaurant dining spaces, hotel pool areas, and recreational parks. 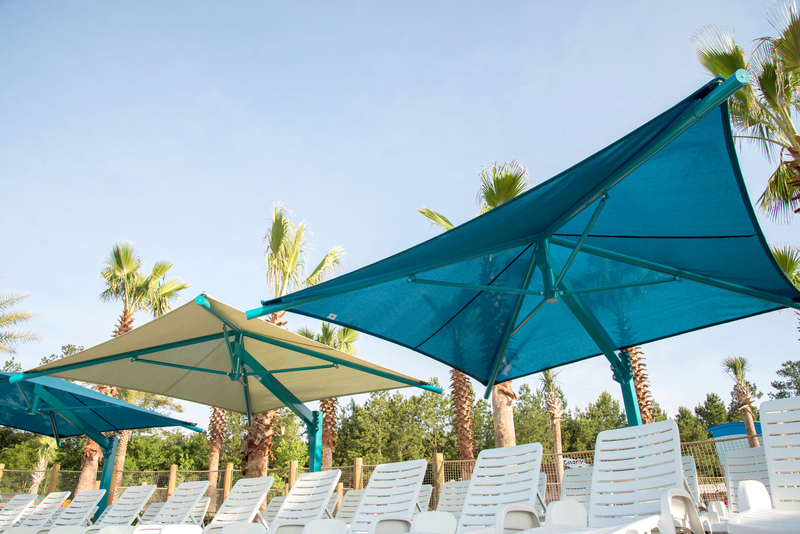 A Superior Shade structure is designed with durable fabric materials on a sturdy frame, with some frames able to be positioned to block the sun's rays at any angle. Are sun shades really necessary in exterior residential and commercial spaces? Check out these benefits and reasons for why a shade structure should be used every time you spend time outside. Outdoor furniture and objects are built to withstand various weather conditions. Yet, being outside for extended periods of time can still cause furnishings to eventually be damaged by the sun. UV rays slowly degrade certain plastic and fabric materials, causing them to age and crack quickly. Colors fade and fabric becomes worn from the sun's intense light. Placing a sun shade above patio furniture, children's playhouses, workbenches, and other items can prolong their life outdoors. Another benefit of shading your objects is that metals, plastics, and wood absorb sunlight, heating up the surface and making them unbearable to touch. Sun shades will keep objects cool so that people can lounge on chairs or children can play on playgrounds without burning sensitive skin. Another unique benefit of sun shades is that they can drastically reduce the temperature underneath the fabric canopy. When outside temperatures reach triple digits, these shades provide a cool spot for people who are getting overheated, where they can rest and rehydrate without the strong sunlight beating down. In addition, shade can prevent children from experiencing hyperthermia, which is a type of heat-related illness when the body temperature elevates to dangerous levels from heat exposure. When children are playing outside, their bodies can heat up three to five times faster than an adult’s body. Providing a place for children to take breaks and cool down is essential so they can have a fun and safe time out in the sun. So consider using these versatile shades for any outdoor space. Protect people and objects from the sun's harsh light and rising temperatures, and let everyone be cool and comfortable when outside.